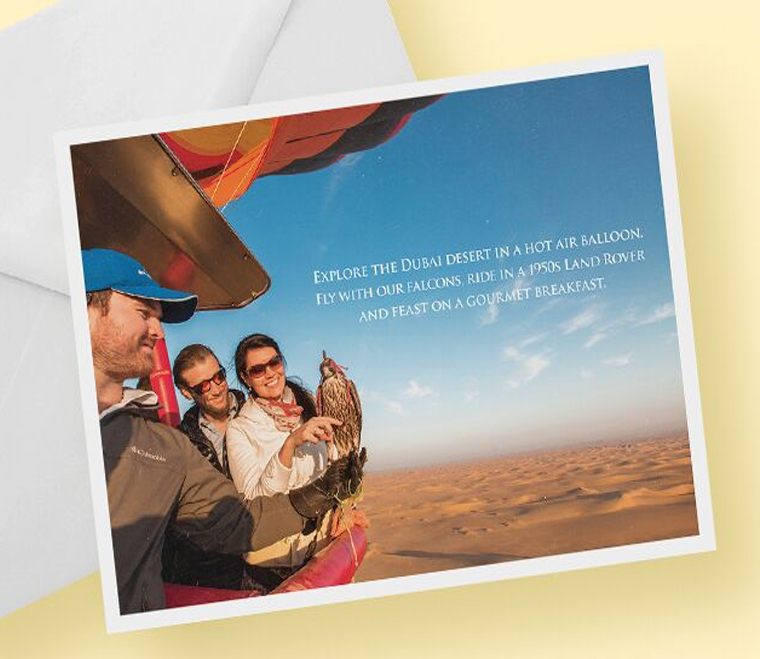 Extend your hot air balloon adventure by adding an overnight desert safari to the experience. Head out to the desert the day before the hot air balloon ride for a heritage desert safari. Experience the culture and heritage of the UAE in this adventure which includes a wildlife drive in the Dubai Desert Conservation Reserve, sunset falcon show, authentic cuisine, camel rides and cultural entertainment. Afterwards, spend the night in Arabic stone dwellings in a Heritage camp before waking up for the sunrise hot air balloon ride. Take a step back in time and experience Dubai as it was 50 years ago on a Heritage Desert Safari. Explore the Dubai Desert Conservation Reserve on a wildlife drive in vintage Land Rovers and see native animals like Arabian oryx and gazelles. Learn about the cultural heritage and natural environment on this authentic Desert Safari led by a professional Conservation Guide. Watch a spectacular sunset falcon show and head to a Heritage camp in the heart of the Royal desert retreat. Arrive at the gently-lit Heritage camp in the desert and receive a traditional welcoming. Spend the evening immersed in cultural activities such as camel rides, henna, Arabic coffee-making and traditional song and dance. Enjoy a delicious 4-course dinner of authentic cuisine in this magical setting under the stars. After dinner, relax in the traditional majlis before heading to bed in your Arabic stone dwelling complete with a bed and full bedding. The good news is that overnight Bedouin camp is only 10 minutes from the Hot Air Ballooning take-off point. Wake up in the desert just before sunrise to tick off the next experience on your bucket list. Since you are only minutes from the Hot Air Balloon take-off site, you can wake up later than passengers coming from Dubai. Once you arrive, you will receive a safety briefing and watch the exciting process of inflating the balloons. After climbing inside the balloon basket you will quickly begin to peacefully float into the sky. Feel your adrenaline race as your balloon drifts gently upwards. Each basket holds up to 23 passengers and there’s plenty of space for you to take in the stunning views as you float over the desert. As you rise higher, marvel at the awesome sunrise views and hear interesting commentary from your Pilot about the geology and wildlife of the protected Dubai Desert Conservation Reservation while you watch for roaming animals such as gazelles and camels. The truly unique thing about flying with us is that you get to experience a world-first phenomenon. 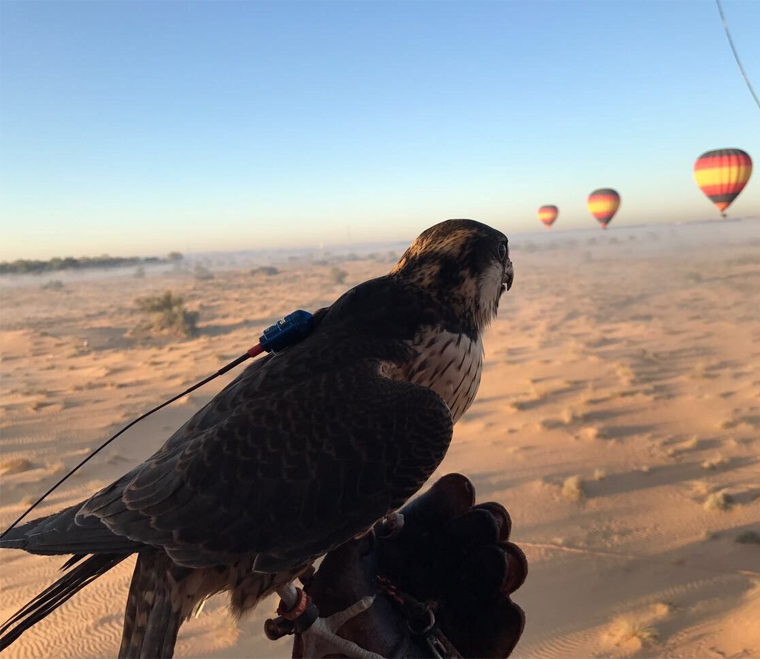 Imagine soaring above the Dubai desert with Peregrine falcons – the world’s fastest animal! 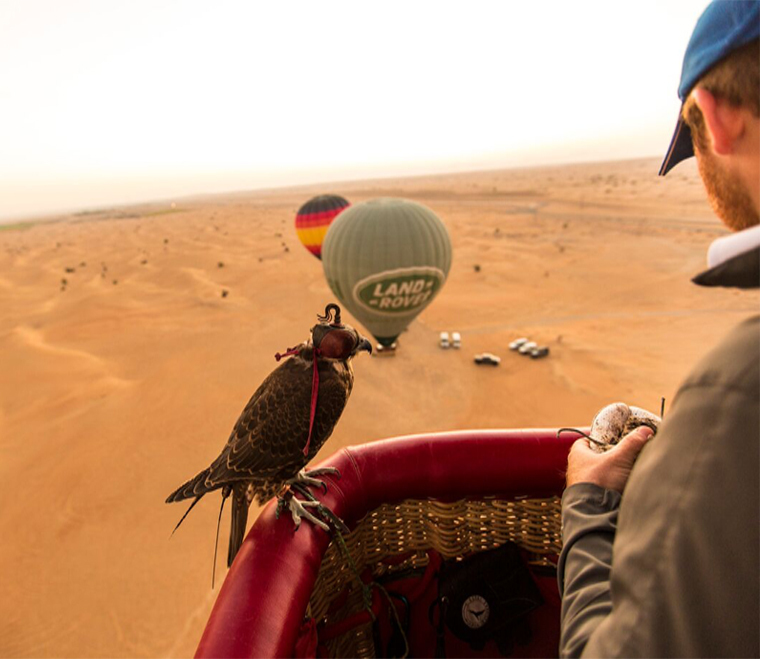 Experience these magnificent creatures in full flight as you get uninterrupted 360-degree views from the Hot Air Balloon, over a kilometre above the desert. Flying around a Hot Air Balloon is the most spectacular falcon show on Earth (or at least above it!). The balloons land somewhere different in the desert every day depending on the wind. Before landing, everyone will attach the clips of their belts to the basket and embrace the landing position. After landing, the Pilot will let you know when it’s the right time to climb out the basket. Watch as the other balloons land and how the ground crew professionally roll up the balloon envelope. Get a chance to hold the falcon you shared the skies with! An adventure like a hot air balloon ride certainly works up an appetite! After the landing, head to the Heritage camp where you slept to enjoy a delicious breakfast buffet. Feast on a delicious breakfast that includes Eggs Benedict, cured meats, caviar, smoked salmon, fresh fruit and so much more! Book online 7 days in advance to receive a complimentary 100% Organic Cotton Balloon Adventures T-shirt to keep for yourself or gift to someone back home. Find out more about our Free T-shirt Promotion. We have a fleet of the world’s largest Hot Air Balloons and can fly up to 115 passengers every morning. Taking a large group up in the air is a definitive ice breaker and provides you with plenty of memories to share, so you can tick off all those team building objectives you have. If you need to make a big impression and have VIP requirements, we have many exclusive options such as luxury transport in Range Rovers and beautiful private areas for your breakfast. Basically, we can tailor the morning to your company’s needs, we aim to please! incentivise your team with Hot Air Balloon voucher rewards. Get the advantage over your competitors when you gift clients professionally printed gift vouchers. Say a very Happy Birthday to your staff. There are many reasons why our Gift Vouchers can make you popular.